This is a brand-new edition of the popular Video Guide to Bird Identification now released with updated footage on DVD. As well as providing superb picture quality, the DVD format offers the added convenience of jumping instantly to any section. The Guide is divided into 17 chapters, each dealing with the birds typically seen in a particular habitat. Expert birder Dave Gosney carefully introduces you to each group and in the course of the video he covers all the main British species. Dave explains in depth the key features to look out for when recognising and distinguishing birds in the field including plumage, behaviour and particularly songs and calls. The beautiful footage makes this film a delight to watch as well as providing a lasting reference. 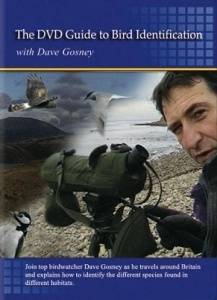 Professionally filmed at top birding locations around the UK with a running time of over two hours. Ideal for anyone wishing to brush up their identification skills or starting birding.